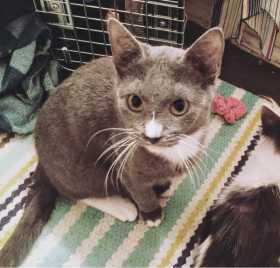 Last seen February 27th in Tulsa, OK near S Urbana Ave 74136 (Silver Oaks) Leo is a small male cat, mostly gray with patches of white on his nose, neck, chest, and feet. Had no collar upon missing, but is microchipped. If you live around S YALE AVE & E 81ST ST and have him or have spotted a cat similar to him recently please let me know.